Start by having a carefully thought-out plan before the first shovel flies or innocent plants are brought home from the local nursery. Adding compost to our clay soils will make the soil more workable and give the plants nutrients such as nitrogen that naturally leaches from the soil with every rain and irrigation. Learn about soil testing to save time, money and reduce water pollution. Bed preparation is essential. 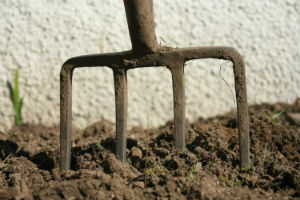 First, remove all grass and weeds, then add compost to a depth of 3 to 4 inches, and till it in. Working the soil when neither too wet nor dry will make the work easier. Next, plant at the same depth the plant was growing in the nursery pot. Water the plants thoroughly for the first few days or weeks depending on the time of planting. Always check soil moisture before watering with a soil moisture meter; don’t let the soil get too wet or dry. Gradually reduce the watering after the establishment period. And last but not least, mulch with shredded hard wood mulch to a depth of 3 to 4 inches. Mulch holds moisture in the soil, while keeping soil cooler in the summer and warmer in the winter. Mulch any open areas to lessen the need to pull weeds. Avoiding inorganic fertilizers will help foster the good bugs in our alkaline soils that make nutrients available to plants. Make your own compost or buy it from the city of Plano at Texas Pure Products, 9901 Custer Road. Includes excerpts from June 11, 2010 column in neighborsgo | Plano | Murphy.